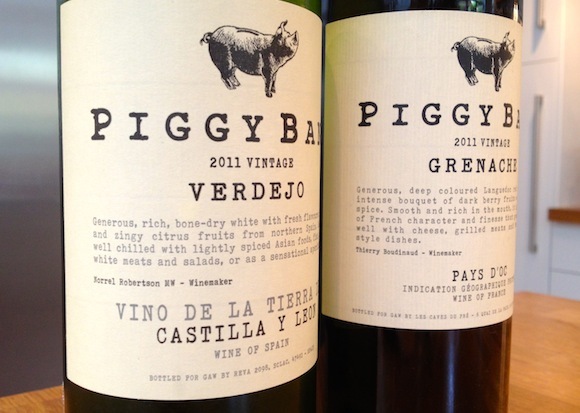 When I first heard about Piggy Bank wine, my cynicism kicked in. I thought that raising money with every bottle sold was simply a gimmick aimed at middle-class bleeding hearts. To make them feel they were doing some good every time they enjoyed a glass or two. I also assumed that the supermarket-sold wine would be dull, mass-produced and over-priced so that everyone involved could each make a decent enough margin – and still cream off 50p for charity with each sale. Based on two wines I was sent by Guy Anderson Wines (GAW), the company behind the concept, I may have been a teeny bit wrong. First off, I loved the simple but stylish labels. Instant eye-appeal. Something I’d reach for on a shelf. Less really can be more. In addition, I liked the idea that you get to vote online about where you want the money GAW raises to go – from a select choice of charities that changes every time £10,000 is in the… piggy bank. You don’t even have to buy a bottle to do that. Just feel “engaged”. Most importantly though, I liked the two wines I tried. The first bottle I opened, a Verdejo 2011 from north-western Spain smelt like a proper old-fashioned “exotic” fruit salad – mainly apples but poshed up with a cube here and there of peaches, kiwi fruit and maybe some honeydew melon. It was more zippy, verdant and pithy to taste, with peach and apple flavours in the background. The next day, it had lost some of its top notes, but was still enjoyable. There was no second day with the Grenache 2011 from the South of France. A delicious combination of soft black plums and liquorice root flavours with a granite earthiness about it, it was intense, smooth and frighteningly easy to drink. Both retail for £7.99 and are available from selected Waitrose stores and online and Ocado. A reasonable price for two tasty wines – especially the Grenache. And one that will appeal to bleeding hearts and their unsentimental counterparts alike.